We students were told by Maharishi University of Management (MUM) that daily homework assignments would consume ninety(90) minutes per evening, yet so many students express investing far beyond ninety minutes achieving homework. In addition to gaining the benefits of the TM Program (which by itself is a major stress management technique), our students also enjoy an organic vegetarian diet, and we encourage students to be in bed by 10 p.m. so as to be as fresh and alert and dynamic as possible the next day. Homework assignments can typically be finished in 90 minutes. This means you won’t have to stay up late studying, which does not promote learning, good health, or well-being. 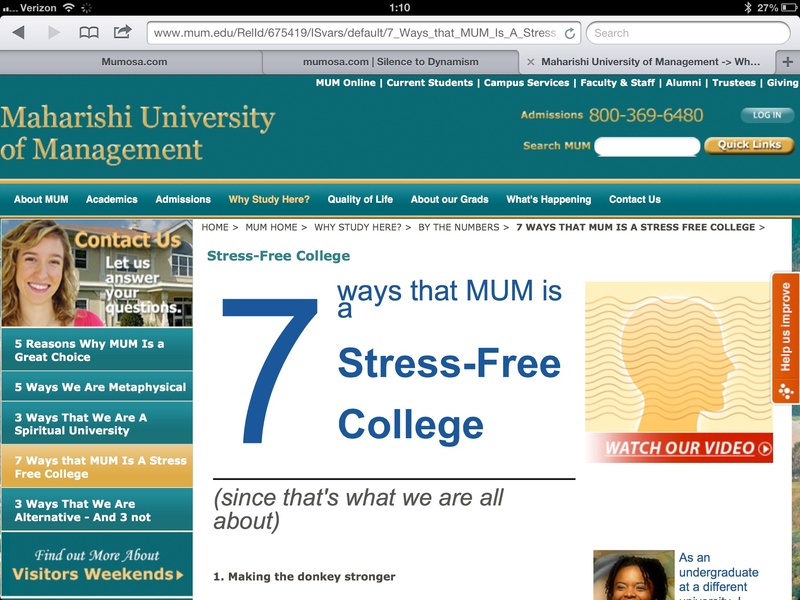 The 5th way Maharishi University of Management is a Stress Free College is through it’s “Stress-Free Routine” which explicitly states the average payload of homework is ninety (90) minutes. I’ve the skills to deploy this website framework in less than 90 minutes, yet rarely have I achieved assignments in less than three(3) hours. Even as a U.S. Navy Engineering student, who understands gas turbine propulsion and solid state electronics in the order of micro-processing and bytecode, I’ve invested as much as six(6) hours in an evening achieving homework at MUM. 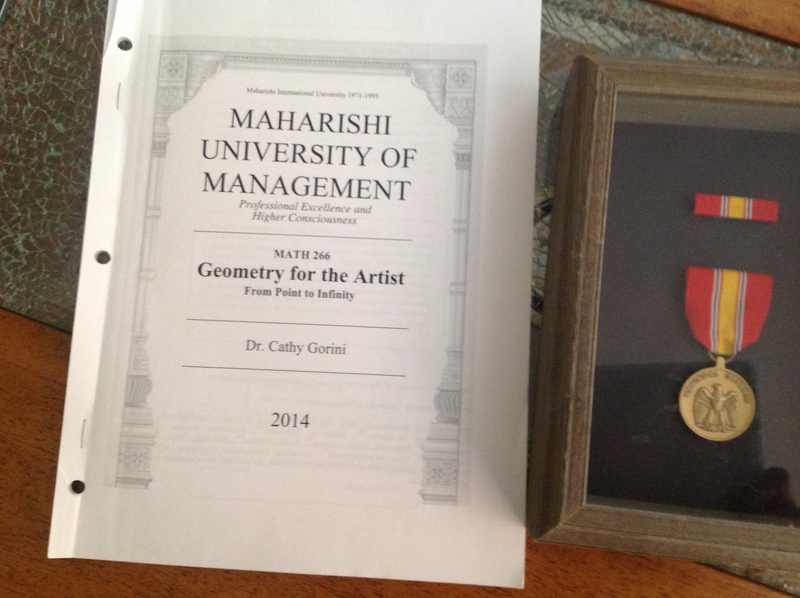 Maharishi University of Management understates the academic payload in respect to homework and reading — or perhaps there is a difference in what the university and myself consider to be exceptionally achieved homework. The homework isn’t cut-and-dry as one would expect, often revolving around fictitious subjects and postulations which require much review and re-reading to be certain the student meets the demands of the homework’s premise. In essence, you spend more time understanding the homework, or trying to figure out what it is exactly that the professors expect from you. In this way, you don’t really achieve homework, rather, you entertain homework in a political and non-academic way. Sometimes it seemed that the harder I worked, the lower I’d score. Often, the reasoning behind point deductions were rooted in semantic arguments. For example one assignment, Assignment 7 Science of Creative Intelligence (STC108), saw a 15% deduction over discrepancies on what a 10-year-old would comprehend; we were to render answers to questions such that a 10-year-old would understand the answers. For a Science and Technology of Consciousness course this is hardly central to the premise, AND numerous 10-year-olds would likely understand my answers just fine — though the homework didn’t specify that EVERY or MOST ten-year-olds needed to comprehend the answers. Over time, it became difficult to take the homework seriously. It was all just a roll of the dice when false opinions swayed a grade 15%. I understood the content of the lesson, I apparently just didn’t properly estimate my professor’s appraisal of ten-year-old cognitive abilities. There’s always some “catch” or “trick” that bamboozles, and it’s these very catches and tricks that consume — waste — time in the scope of HOMEWORK. Moreover, the lesson never addressed the “cognitive abilities” of ten year olds — additional research and consideration beyond the scope of the class. I spend more time, sometimes, rendering a disambiguation of the source text and lesson than on the homework itself. This is because my classes — thus far — lack text books. Rather, students use a printed syllabus; an iteration of a database which the university is — hopefully — consistently editing. Here’s an example of a sentence from my alleged post secondary level geometry class MATH266. 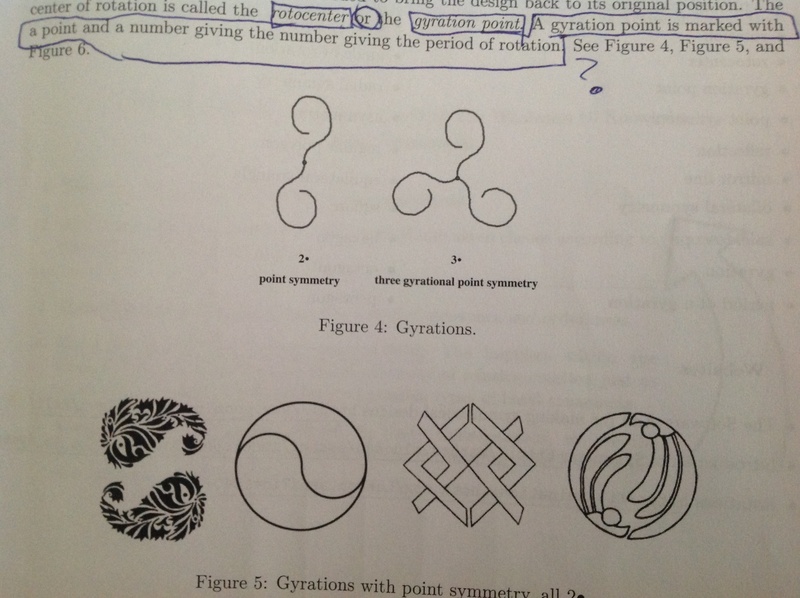 A gyration point is marked with a point and a number giving the number giving the period of the rotation. That wasn’t any sort of typographical error on my part, that’s exactly what the text says. — snapshot included as proof. Behold the college level geometric blunder that is in part and parcel the corpus of Maharishi University of Management curriculum. The cover of the syllabus for MATH266 at Maharishi University of Management. Maharishi University of Management‘s claim “Homework assignments can typically be finished in 90 minutes” is overtly misleading. While perhaps particular classes may mention average homework durrations, it’s rather strange that a university on-the-whole would stake such a claim. So why is this claim so important? In my opinion, it’s a function of suggestion that the homework component will consume an additional 9 hours weekly. It’s a false disclosure, it feels as if the university is being upfront about a hidden additional academic investment of time, which they’ve conveniently quantified through no means in particular. Claiming six of seven days of the week from the hours of 10 A.M. – 3:15 P.M. in the classroom, students render weekly academic performance near 30 hours each week. So naturally, prospective students are tempted to total the class time and homework so as to derive a more precise notion of the education’s weekly payload; About 40 hours weekly. It’s as if the matter of time consumption has been resolved, and therefore — accepting these seemingly certain terms — prospective students move on to further consideration as they browse the university’s website. 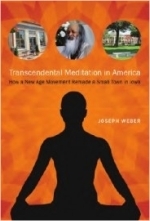 But the truth is, Maharishi University of Mangement poisons the well in their hasty secundum quid generalization of quantifying homework in the scope of a 90 minute time frame in lieu of preimptively deflating the notion that their consciousness based education might consume nearly as much time outside as it does inside the classroom. In my experience class-time, homework assignments, weekly test preparation, transit, and class projects consume upwards of 55 – 60 hours weekly; 30 % more than I was led to believe.